As Syria enters its seventh year of war, leaving millions of refugees and internally displaced people in need of emergency and humanitarian assistance, UN Women will join major donors, government representatives, UN agencies, civil society, humanitarian and development organizations at the “Brussels conference on “Supporting the future of Syria and the region” taking place from 4 – 5 April. The EU, Germany, Kuwait, Norway, Qatar, the UK and the UN co-chair the conference. The EU-hosted international conference will assess the current situation in Syria, progress made towards fulfilling the international commitments made at the London Conference in February 2016 and agree on additional measures needed. UN Women and partners will draw attention to the acute and unique vulnerabilities that women and girls continue to face in crisis and displacement settings due to pre-existing gender inequalities. For example, only 2 per cent of the 36,000 work permits issued for refugees residing in Jordan to date have been issued to women . The enormous gap between women’s and men’s employment opportunities have multiple and deep impact on women’s ability to engage in the economy and on food security of female-headed refugee households. At the Brussels Conference, UN Women, along with partners, will seek to renew the international community’s support for women’s access to equal opportunities in economic and political engagement, as donors transition away from providing in-kind support through cash and non-food items towards investing in creating and sustaining livelihoods for crisis-impacted communities. Even as they bear the brunt of violence and heightened vulnerabilities, Syrian women are leaders in their own right. Their early organizing at community levels has not easily translated into a voice and influence at the international level, or among key parties to the conflict. On 4 April, Mr. Glemarec attended a lunch roundtable event co-organized by the Government of Norway, UN Women and CARE International, on the sidelines of the Brussels conference. It convened Syrian women activists, representatives of governments, including State Secretary Laila Bokhari of Norway, and other key humanitarian actors to discuss the key role of women in building resilience and responding to the crisis. UN Women Deputy Executive Director Yannick Glemarec also met with members of the Syrian Women Advisory Board, alongside with High Representative Federica Mogherini and UN Special Envoy Staffan de Mistura. 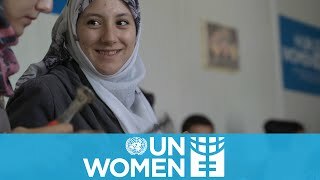 UN Women works in Za’atari refugee camp to support refugees to meet their daily needs, while also working to build confidence, empowerment and equality.